The great yogi Milarepa said, “This life is mere illusion, a mere dream. Be compassionate towards beings who don’t understand this.” All our various experiences and dreams are simply the magical display of our thoughts. Until our thoughts are cleared away and dissolve, karma and disturbing emotions will not end. It is important to understand that thoughts themselves are karma and disturbing emotions. Life is like a magical illusion or a dream. Because we are asleep, unaware, we dream up all types of different episodes, involving various degrees of pleasure and pain. In this sleep, everything feels as if it were real. The moment we wake up, however, it is obvious that all those experiences have no real existence. Yet, within the dream, they felt the same as our daytime experiences. The anxieties, the fear, the worry we entertained in the dream are all completely unreal, but while dreaming, we do not know them to be a dream, to be illusions. Only after we awake do we realize, “Wow, it was a dream — only a dream.” We can even laugh at ourselves for being so overtaken! If it was disturbing, we are happy to wake up, while we feel a sense of loss upon awakening from a pleasant dream. I’m using the example of a dream as a metaphor for our waking reality. All things, all of our ordinary experiences, are like dreams. They are as essentially insubstantial as the moon reflected in water. Though from time to time we have a hunch that this might be true, only after we have spent some time learning, reflecting and meditating do we fully understand that our life experiences are like a dream. Three kinds of knowledge are necessary to ascertain the nature of things — the basic situation, you could say. First is the knowledge resulting from learning. When we examine, analyze and inspect what we learn, we are able to gain the second type of knowledge, resulting from reflection. Finally, we achieve the third type of knowledge by making what we’ve learned part of our own experience through practice. Through these three types of knowledge, we are able to completely end the cause of confusion. Everything that we see, everything that we experience, appears due to a combination of factors. Nothing has any independent or true existence. Everything is ‘groundless and rootless’, yet appears due to dependent origination. While this is definitely true, a buddha does not explain this immediately. Being wise, compassionate and extremely ingenious, a buddha teaches in a manner that is practical for people to understand, which means he teaches in a gradual way. Very few of us are able to grasp the nature of things instantaneously. Therefore, Buddha Shakyamuni turned the Wheel of the Dharma in three consecutive ways. The first set of teachings focused on the Four Noble Truths, and the second set concentrated on the Absence of Characteristics — a synonym for emptiness. His third Dharma Wheel fully reveals the nature of things, and is therefore known as the Total Uncovering. 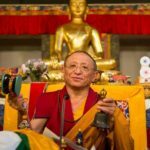 The first set of teachings is clear, the second very clear and the third extremely clear! Simply put, the Buddha’s message in the first turning of the Wheel of Dharma is that anyone with a dualistic frame of mind suffers. The dualistic mind entertains selfish emotions, creates karma, has worries, hope, fear and pain. Dualistic mind seems to have built-in suffering. There is an immense variety of suffering, but all of these can be included within three types: the suffering of change, the double suffering of unpleasantness piled on unpleasantness, and the all-pervasive suffering of being conditioned. This is not a matter of mere philosophy; it is very real. We can and do experience suffering, discomfort, distress, and worry throughout our lives. Dualistic mind is always ready to be upset, to feel uneasy. An input from the senses, a memory or anticipation that is either a little pleasant or a little unpleasant always has the power to disturb us. In addition, there is one suffering which we can never ultimately sidestep: death. Suffering does not mean that life is continuously painful or that everything is unpleasant. It does mean that happiness or pleasure does not last, it is not forever, and it is never perfect. Even when things seem to be wonderful and we have achieved what we want, we still worry, thinking, “Is it going to run out? Is it going to get a dent? Am I going to lose it?” Pleasure mixed with apprehension is rendered imperfect. “Am I going to lose this happy feeling?” “Is there a greater happiness I could get instead?” Worry spoils the pleasure. The three types of suffering are not difficult to understand. There is the suffering of change. Double suffering is simply the fact that suffering is already unpleasant, and that this unpleasantness can easily become compounded. Things can get worse. The third type is the suffering of being conditioned, which is both more subtle and more all-pervasive than the simple ability to be hurt. For example, if a thorn pierces our skin, we immediately have pain. While in this physical body, it does not take much to hurt. In fact, it takes very little. Even a bad smell can be enough to upset our sense of equilibrium. If it’s a particularly nice smell, our minds also become a little disturbed. It seems that fickleness is a quality that’s built into our present, dualistic state — even more so than the fickleness of a small child. We can certainly all agree that there is suffering. This is the first point, to acknowledge that there is suffering. The second point is to understand that it is not uncaused, there is a reason. The reason we suffer is due to karmic actions and selfish emotions. Karma and emotions have one driving force — the belief in ego. Clearly, there is only one way to solve this dilemma: to realize egolessness. In a nutshell, then, the realization of egolessness is the quintessence of the Buddha’s first turning of the Wheel of Dharma. The notion of “Me” or “I” is held so strongly that it’s taken as an absolute given — yet it is mistaken. To reverse this misconception of an existing “I,” we need to investigate and come to the conclusion that there is no real ego. After that, we need to train in remaining in the state of equanimity where no notion of self is held in mind, the state of egolessness. This solves the entire problem. It is like cutting a tree at its root: all the branches, twigs and leaves wither at the same time. To have dissolved ego-clinging and to be stable in the knowledge that realizes egolessness is simply another description of freedom, liberation, great peace. This is extremely profound, and it is real. In the second turning of the Wheel of Dharma, the Buddha went deeper. He taught that not just ego, but all phenomena, are empty and devoid of true existence. The Prajñaparamita scripture titled the Sutra on Transcendent Knowledge in Eight Thousand Verses teaches that perspective with extreme clarity. 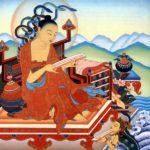 The Buddha taught on emptiness in incredible detail, and it may be difficult for one person to fathom all of his sutras and their commentaries. We may not have either the intelligence or the diligence that it takes to study all his words. Based on this, great masters of the past in India composed treatises condensing the vital points of the Buddha’s teachings into small scriptures of sometimes only a few pages. Some of these condensations of the intent of the Buddha’s second turning of the Wheel of Dharma are found in Nagarjuna’s Middle Way treatises on reasoning. The Middle Way declares that everything from the aggregate of form up until the state of omniscient enlightenment, is empty and unconstructed. The practical application of this settles our mind in a state that is empty and free of preconceived thought-constructs, and lets us proceed through the path to enlightenment. This path is composed of two factors: knowledge and means. The supreme knowledge is the knowledge of profound emptiness, which is the sixth of the six paramitas — transcendent knowledge. The most eminent method is described by the first five paramitas — generosity, discipline, patience, perseverance and concentration — embraced by the profound emptiness of the sixth. This unity of means and knowledge is the very heart or quintessence of the second Dharma Wheel, the intermediate set of teachings on the absence of characteristics. 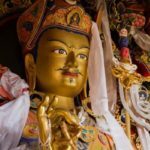 During the third turning of the Wheel of Dharma, the Buddha explained in a way that is even more clear. Not only is everything from the aggregate of forms to omniscient enlightenment unreal, empty and devoid of mental constructs; in addition, everything is luminosity. This third set of teachings is meant for people who are more intelligent and bold. When first hearing a term like luminosity, a student might think, “What the heck does that mean? It sounds secret!” At first glance, it seems the second set of teachings is easier to understand than the third, just as the first is easier than the second. While it’s not entirely incomprehensible that all phenomena are empty, from the aggregate of form up to the state of omniscience, the first turning is easier or simpler to understand. Ego is the creator of suffering; the enlightened mind is egoless. This is logical, and understanding this is very beneficial. The third turning of the Wheel of Dharma, the final set of teachings, is the intent of the tantric teachings. Tantras are described as being of different classes or types: father tantras, mother tantras, and nondual tantras. Vajrayana is also known as the vajra vehicle of Secret Mantra, the vehicle that uses the fruition as the path. One practices Vajrayana firmly based on the foundation of the two first Dharma Wheels, and not as a separate practice. 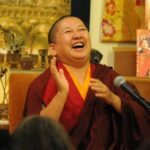 Vajrayana practice is based first of all on acknowledging suffering. We must be fed up with suffering in order to seek liberation by realizing egolessness. On a deeper level, we experience that everything from the aggregate of form to omniscient enlightenment is empty, unconstructed and insubstantial. 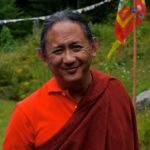 Now, in Vajrayana, we additionally realize that everything has a luminous nature. 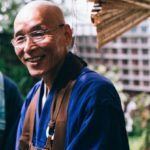 This may be hard to understand, especially if one’s understanding is merely intellectual, if one only studies the teachings and does not practice. During the ages, a lot of debate and dispute has arisen over exactly this point. The tantric perspective is described as emptiness endowed with the supreme of all aspects, unchanging great bliss and original wakefulness that encompasses samsaric existence as well as nirvanic peace. This is the intent of the third turning of the Wheel of Dharma. This original wakefulness that encompasses all of samsara and nirvana: where is it right now? Where is this unchanging great bliss; where is this nature; where is the emptiness endowed with the supreme of all aspects? All these terms refer to something that is intrinsic to our mind, something that is present right now at this very moment. It is not to be found outside in the earth, in the water, in the wind, in the fire or in physical space. At this very moment, right now, we have some sense of knowing, of experiencing, don’t we? This is mind. Mind is this knowing. Though there seems to be a knower, when we look, we do not find it. It is unfindable, like empty space. Physical space is defined as that which accommodates. The word spacious itself means open and accommodating. When something is concrete, a physical form, we feel it earns the right to have a name and we attach a name to it. When something is inconcrete, not composed of physical matter in any way whatsoever, just wide open; we also give it a name. In the first example, it is because there is something that we can give it a name. In the second instance, it is because there is no thing, nothing, that we name it as well. This second case involves something that is not and yet functions; something that can both be identified and yet cannot. Exactly how do we identify space? It is not something to see, to hear, smell or taste, not something touch. It is not earth, water, fire or wind. Yet it does function in that it accommodates everything else. That is the identification of space. Thus, if you want to identify space in a positive sense, in terms of it being such and such, you can do that. And if you want to identify it in a negative sense, in terms of it not being such and such, you can also do that. It’s exactly the same with identifying the knower, mind, thinking: it can be identified, if you want, to be such and such. Or it can be totally unidentifiable if that is what you want. It’s merely a matter of perspective. To go back to the tantric perspective: this “emptiness endowed with the supreme of all aspects, this unchanging great bliss, this original wakefulness encompassing all of samsara and nirvana,” is contained within the nature of our mind. Because our nature includes such qualities, it is called the buddha nature, literally, the essence of the sugatas. We do not have to rely only on assumptions to directly prove to ourselves that we possess a buddha nature. When you see smoke, you can infer there is fire below from which the smoke arises. In the same way, any person, no matter how wicked he or she might be, still has some object of love, of affection. That is a sign that in that person there is love, from time to time. Also, any kind of person, no matter how stupid, still has some wisdom, an ability to discern what is useful, what is harmful, and then to choose. Even if the individual is very selfish, there is still some intelligence. Everyone has an ability to do something. In other words, these qualities are intrinsic to everyone; they are intrinsic to the human mind. They may be very limited, they may be hampered, but we all have these qualities of caring, of knowing, and of being capable. Moreover, we have the ability to acknowledge that our mind is insubstantial. The knowledge of emptiness is at hand. 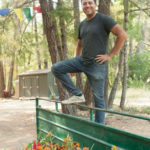 When we allow our minds to be undisturbed for a little while, not caught up in likes and dislikes, we experience some sense of well-being, an easiness that is carefree. It may not be the unchanging great bliss at this point, but it is present in every one of us. The emptiness in our personal experience may not be the fully-fledged emptiness endowed with the supreme of all aspects. The original wakefulness encompassing all of samsara and nirvana is not yet fully perfected. It’s as if these qualities are enveloped in something; they are hindered from being manifest. In the Buddhist teachings, that hindrance is called obscuration. Therefore, our nature can be described at this point as obscured suchness. A sentient being is obscured suchness. A buddha is unobscured suchness. That which obscures the suchness are emotional and cognitive obscurations. That which removes emotional obscuration is the six paramitas, loving kindness, being compassionate. In particular, the true view of emptiness thoroughly removes emotional obscuration. Cognitive obscuration, on the other hand, is much more difficult to dissolve, to be free of and to utterly abandon. Only present, fresh wakefulness — the original wakefulness that does not conceive of anything, that does not hold onto the three spheres of subject, object and action — can totally dissolve cognitive obscuration. Cognitive obscuration means to conceptualize these three factors. That which can dispel it is the original wakefulness that does not conceptualize these three spheres. When the two obscurations are purified, the twofold knowledges unfold. These twofold knowledges are already present within us. They are the knowledge of knowing the nature as it is — the realization of it as being empty, unconstructed, and insubstantial — and the knowledge of perceiving all possibly existing things. The perfection of the twofold knowledge reveals the two kayas. The two kayas are dharmakaya and rupakaya. Dharmakaya is unconstructed, while rupakaya, the form body, includes both sambhogakaya and nirmanakaya. When the knowledge that realizes egolessness, the realization of the unconstructed and empty quality of all phenomena, is recognized, trained in and stabilized, one is called a buddha. The word buddha in Tibetan is sang gye. Sang means purified, and gye perfected. A buddha has purified the two obscurations as well as the habitual tendencies for them and has perfected the twofold knowledges. Such a being has established certainty of the natural state and vanquished all delusion. All confusion, disturbing emotions and karmas are obliterated. Unless the intent of the third turning of the Wheel of Dharma, the luminous nature, emptiness or original wakefulness is fully realized, that accomplishment is not considered true and complete enlightenment. Without that, the complete qualities of the awakened state are not manifest. These complete qualities include the twofold knowledges. To reiterate, the twofold knowledges are the knowledge of knowing the nature of reality as it is — the realization of it as being empty, unconstructed, and insubstantial — and the knowledge of perceiving all possibly existing things. A buddha can, in a single instant, simultaneously perceive the manner in which all phenomena seemingly appear through dependent origination. A buddha simultaneously sees how phenomena are perceived by sentient beings as being real, how this mistakenness occurs, when it occurs, when it occurred, when it will be dissolved in the future, and what the causes and consequences of everything are. All of that can be perceived in a single instant. That is called the knowledge of perceiving all possibly existing things. The basis of delusion is ego-clinging, to hold on to the idea of I. Delusion is grounded in a lack of understanding of how the nature of all things is empty and insubstantial. The basis for delusion is also to fail to recognize the luminous nature of things. By realizing the nonexistence of a self and releasing the tight grip of ego, we will naturally and automatically understand that all other things are empty and devoid of identity. In this way, the intermediate set of teachings is more profound than the first. It is not just the mind that is insubstantial; everything else as well is naturally empty. Not knowing that everything is naturally empty is ignorance and confusion. Similarly, compared to the second set of teachings, the perspective of the third set is more profound. Not only is everything empty and unconstructed: it all is a state of purity totally endowed with immense qualities. When hearing what the Buddha says about how things are, we as individuals can understand something. We do get a feeling that, “Oh yes, it is like this.” We have some confidence. The Dharma and especially the pith instructions address exactly what is wrong and how to change it. They hit home. We may study Buddhism. We may think about it and reflect. But, most essentially, we need to practice, to train in the great meditation of nonmeditation, as soon as possible. Do not think, “I will practice later.” That attitude makes it never: our time simply runs out. Time will not wait for us. The ultimate practice is undistracted nonmeditation, which obliterates the root of confusion. It totally and permanently obliterates all karma, disturbing emotions and habitual tendencies. To begin with, we need some method, some techniques to lead us to the ultimate. The best method is of course effortlessness, but effortlessness cannot be taught, or chased. Even if we try — especially if we try — we can’t become automatically effortless. Effortlessness just does not seem to spontaneously take place. Still, it is a fact that confused experience falls apart the moment we simply let be in a nondualistic state. Right now, for most of us, every moment of ordinary experience is governed by conditioning. Our present habit is dominated by a deliberate effort. We have therefore no choice but to use our present habit of deliberate effort to arrive at effortlessness. Once we are accustomed to effortful meditation, we can make the leap to the effortless state. In this book, I will unfold the various ways to arrive at nonconceptual, present, fresh wakefulness, beginning with conceptual practices. I’ll cover some of the topics quite cursorily, so it is best if you gain familiarity with my other books, if you have not read them. The Union of Mahamudra and Dzogchen and Indisputable Truth contain many detailed teachings. For that reason, I do not feel the need to repeat here in this book what I have previously said.